Atheists T Shirts now back in stock! Get Atheist shirts, books and more at Revolution Books! 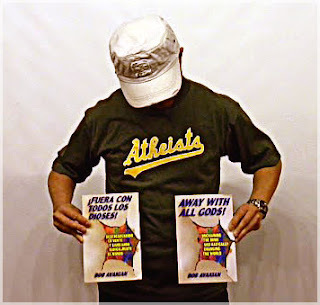 Revolution Books is the place to score your Atheists Tee Shirt designed by Revolution Books! Express your reality-based love, critical thinking and team spirit by sporting an Atheists t shirt at the next big game. by Bob Avakian, the chairman of the Revolutionary Communist Party, USA. "What most distinguishes Avakian's Away With All Gods from other much publicized books of this kind, such as those by Dawkins, Harris, and Hitchens, is the direct connection Avakian makes between combating religious fundamentalism and promoting a radical political agenda. Avakian is also to be commended not only for combining his religious freethinking with an endorsement of the modern Enlightenment tradition, but also for providing a sober warning against 'the smug arrogance of the enlightened.' Anyone who has read any of the other books mentioned above should also take the time to read this one."